Oil on canvas, 27 x 23 cm. Frederik Vermehren had an ability to observe his subjects with a special veraciousness, which can be clearly seen in his portraits of people from different backgrounds. 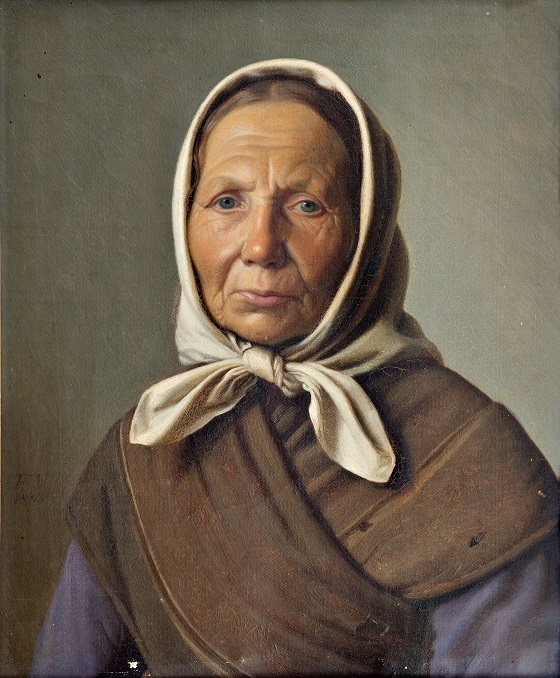 In this head and shoulders portrait of a fisherman’s wife, the artist has sought to bring out the older woman’s personality by portraying her in a true-to-life fashion. The hard and at times miserable life as a fisherman’s wife is imprinted in her windswept cheeks and worn-out clothes. Her gaze is marked by a deep sadness, amplified further by the worry lines on her forehead. By portraying her in such a way, Vermehren sought to show how a person’s identity is shaped by their environment.